5RM: Curved Magnum Tattoo Needles 50 per Box for $13.00. 7RM: Curved Magnum Tattoo Needles 50 per Box for $15.00. 9RM: Curved Magnum Tattoo Needles 50 per Box for $15.00. 11RM: Curved Magnum Tattoo Needles 50 per Box for $16.00. 13RM: Curved Magnum Tattoo Needles 50 per Box for $18.00. 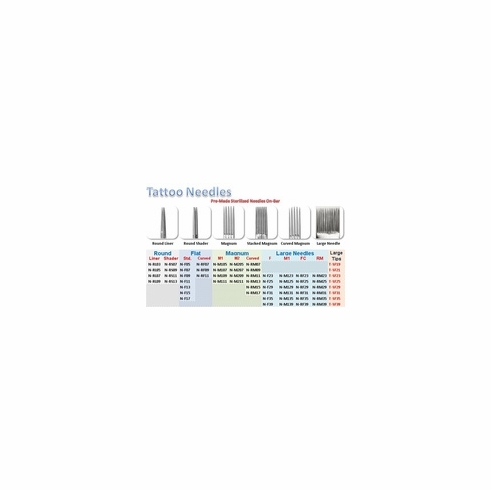 15RM: Curved Magnum Tattoo Needles 50 per Box for $18.00. 17RM: Curved Magnum Tattoo Needles 50 per Box for $18.00. Commonly used exactly the same as single stack magnum needles except the outer needles are shorter than the needles in the middle of the configuration. The grouping is the same as single stack magnum needles. The purpose and benefit of a curved single stack magnum tattoo needle is to achieve softer edges for filling and shading.